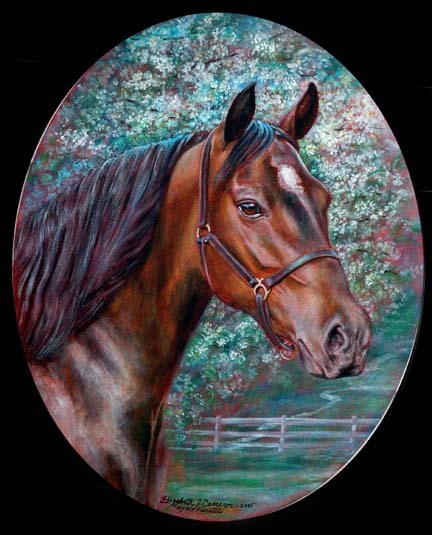 "Okeden Clover" is Fran Martin's Welsh Cob mare. busy with her broodmare duties. and is expecting in 2005! of her son as a surprise for her dad! 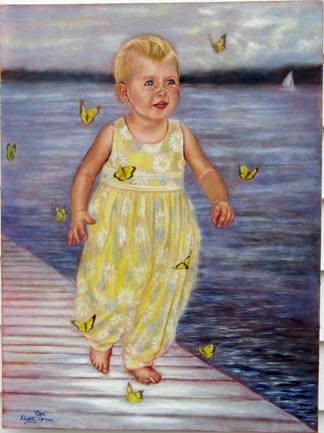 Her parents absolutely loved the painting. her father's young standard poodle. matched the tooling on the saddles! Christmas so soon another painting will be in the works! 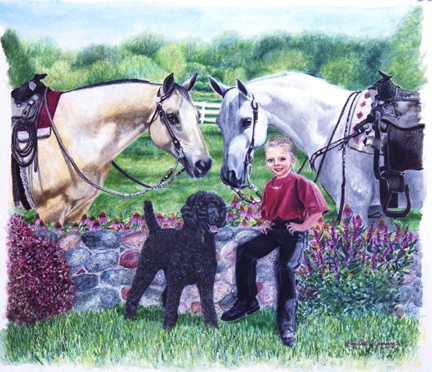 "Pauline Jakubiec with Mr. Ed & Dylan"
great important presence about her! as a Christmas surprise for her husband, Don. 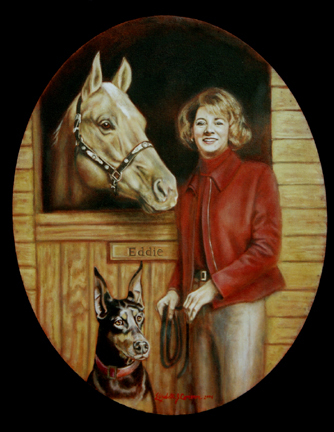 Lisa and Don own Windrose Arabians in Kenosha, Wisconsin. I loved James's worn knee jeans and 'Ralph Lauren' look! to really make the painting jump out at you! 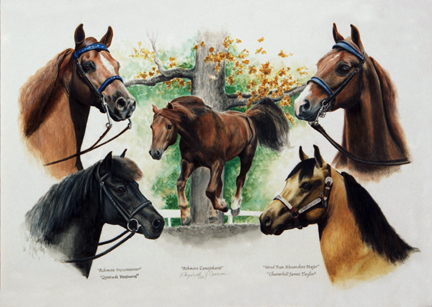 "Five of Julie Heise's Morgan Stallions"
Julie Heise created my website. "Andre Norton" and her daughter behind her "Tony Fennelly". in a field near her barn. I decided I needed a painting of them. Of course, I called on Libby. creating a treasured heirloom-to-be for my family!" 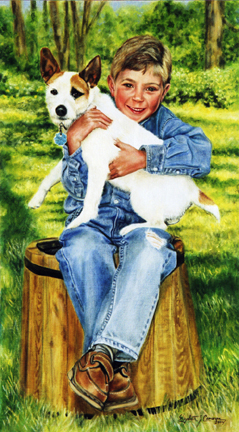 This was commissioned by Mrs. Lura's son, Mark. 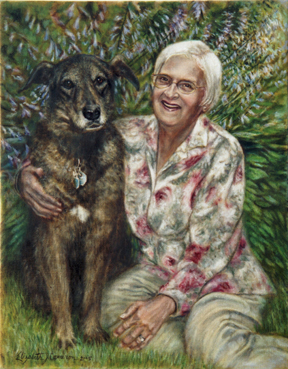 Mrs. Lura has with her dog, Nina. in their yard made a perfect natural setting. wedding ring. What a lovely family heirloom. the expression on her face. It is exquisite. watches over me while I sleep." Note this happy dog's favorite yellow frisbee too! is getting to meet other great animal lovers. 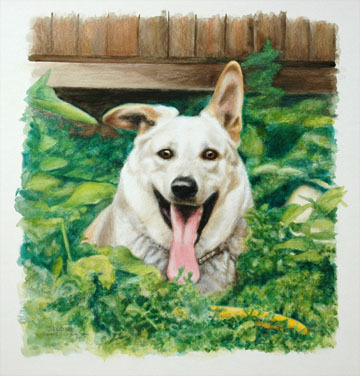 in a series of his family's dogs that Mark is having me paint. 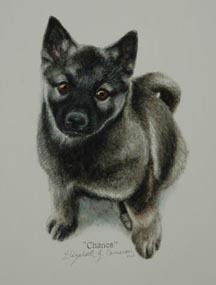 His sister Val's Elkhound is next in the line up! not be sufficient perspectives for Libby to do him justice. when he was alive. A real tribute to a fabulous Best Friend." 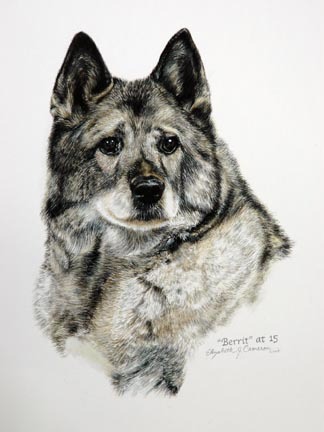 This was commissioned by Clare's mother, Margaret. to her older sister Meredith's portrait! She is shown on the dock near their Lake Geneva home. her childish delight in running through a flock of butterflies. 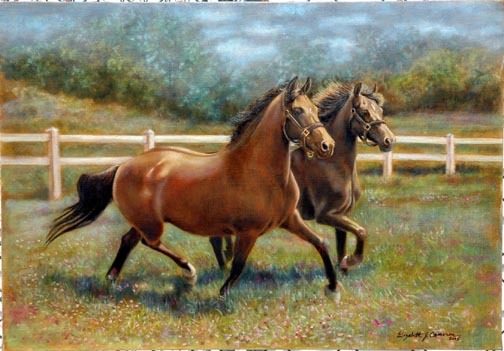 "Roy-el's Faerietale In Spring "
"Berrit at age 15 "
with their guy Tugger when she was a year and a half old. 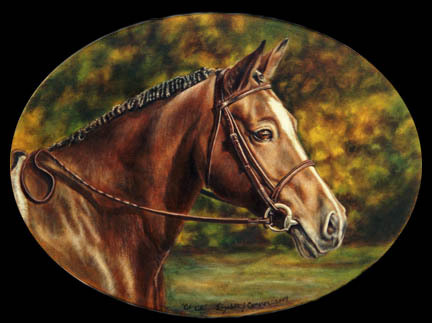 portrait when age had so beautifully etched her face. Ah that we could all be as well-loved as the Budny's Elkies! 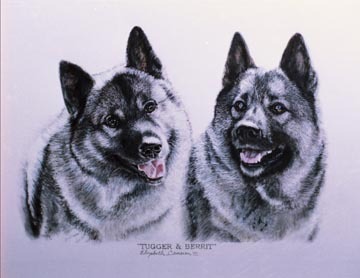 The young Tugger and Berrit. Your referrals are my highest compliment!